Ok – so I’m at the 15 hour mark, but don’t see any harm in checking out how the autopilot is working. I performed a detailed preflight this morning and launched for KGED from Wilmington. Weather was severe clear, but damn those winds and bumps were kicking. The mystery vibration is back, so I climbed to 3000′ and did some experimenting. In turn, I turned off each magneto for the left and right engines, one at a time. No impact. Next I brought the throttles to idle on the right and then the left. the vibration was less in all cases, but there were no distinct clues as to where the issue was coming from. Maybe I’ll climb high and do and airspeed test to see if it changes with airspeed at a constant power setting. For now I was experimenting with the altitude capturing features of the autopilot, and moving the pitch trim wheel for the first time in several years. That may not have been a great idea, and the airplane all of the sudden couldn’t hold its altitude properly. There were two other airplanes arriving for the same approach along with me, when I canceled flight following and changed frequencies. The wind was 40+ mph out of the southwest, and I became distracted with the sudden lethargy of my autopilot in holding it’s altitude. KGED GPS 22: I arrived over HUVOX with the COUPLER set in HDG and the Aspen set in GPSS mode. Altitude was 100′ low and I finally figured out that my airspeed was below 130 and that contributed to the inability to hold altitude. The A/P has a 130 mph limitation. Establish on the final approach course and still 3nm from HUVOX, I moved the COUPLER to the LOC position as shown in the diagram. There was a cirrus on 2nm final; a Bonanza 3nm behind me; and a Baron I think it was in there as well. Slowing the airplane for it’s 130 mph approach speed gave me a ground speed of just over 80 kts. I worried I was bottling things up or getting run over, so I made sure my traffic page was up. The blue glideslope light came on and the airplane began to slowly follow it. My airspeed was 130 and things were looking acceptable. Then all of the sudden the autopilot stopped pushing the nose over, deviating from the glide slope. Eventually the distractions were so great that I climbed to 2000′ and flew the beginning of the missed approach. That resolved my traffic issues, but I was spending time working on the autopilot; trying to figure out just what was going on. Too much head down and inside time, I admit. My altitude climbed to 2300′, and I called Dover back. Approaching HUVOX again and back down to 2000′, I tried re-engaging one more time and the autopilot would no longer hold altitude. 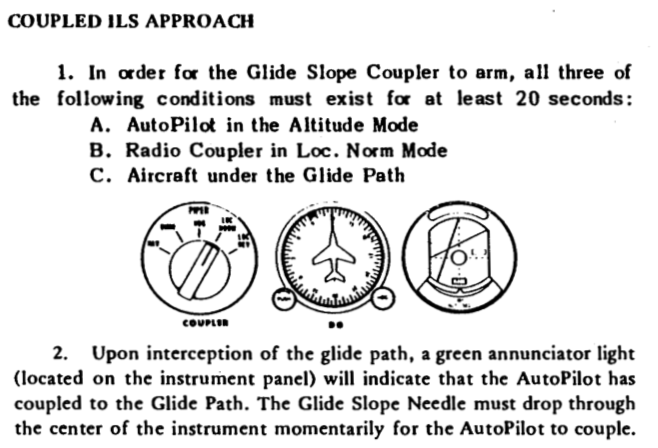 Each time I engaged it, the airplane began a descent even though the level indicator showed a climb was required. Enough already! I turned off the altitude control and continued to use the lateral mode of the autopilot, flying a nice approach to land on rwy 22. The landing was fine, but I forgot to disconnect the autopilot after all these gyrations, and was fighting it without realizing it. I’m not happy with missing stuff today. I taxied in and filled all the tanks once again, departing as soon as Bump took care of that. The flight up to Wilmington was uneventful, other than continuous light chop with occasional moderate turbulence. On arrival they gave me the right downwind rwy 19 because a slower C172 was on left downwind and I was screaming inbound. I still ended up #2 behind him, and used rwy 27 to taxi back to the West T’s. I’m tired today, and just a little frustrated at making mistakes. I should have kept my speed up on the approach; not been so distracted by the autopilot; and not been so heads down all day. Fly Safe. I can fly better than this! This entry was posted in Home Page by fdorrin. Bookmark the permalink.